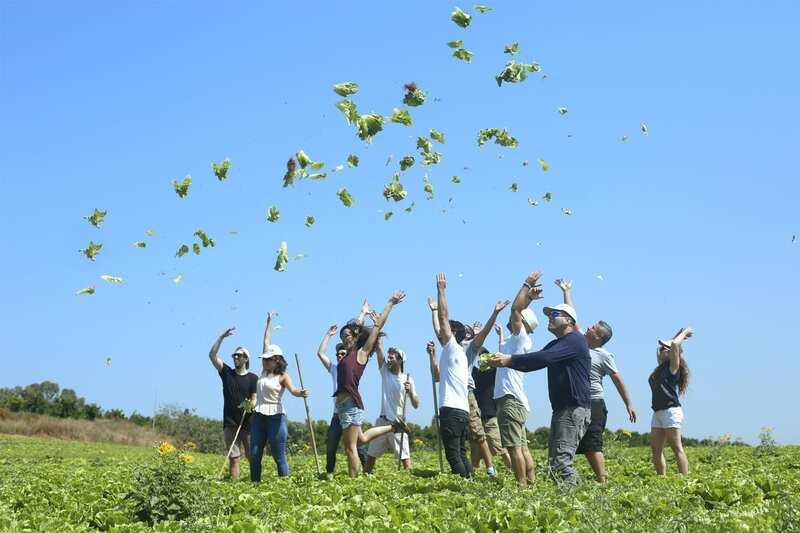 At four in the morning, when the dew still beads on basil and mint leaves, and the zucchini flowers are still cool to the touch, Gideon Belinski and Yuval Helman venture out to pick the day’s produce with their Aleh Aleh staff. Unbelievably fresh and of the very finest quality, the food is brought to the kitchens of Israel’s finest gourmet restaurants – including Mashya and Kitchen Market. 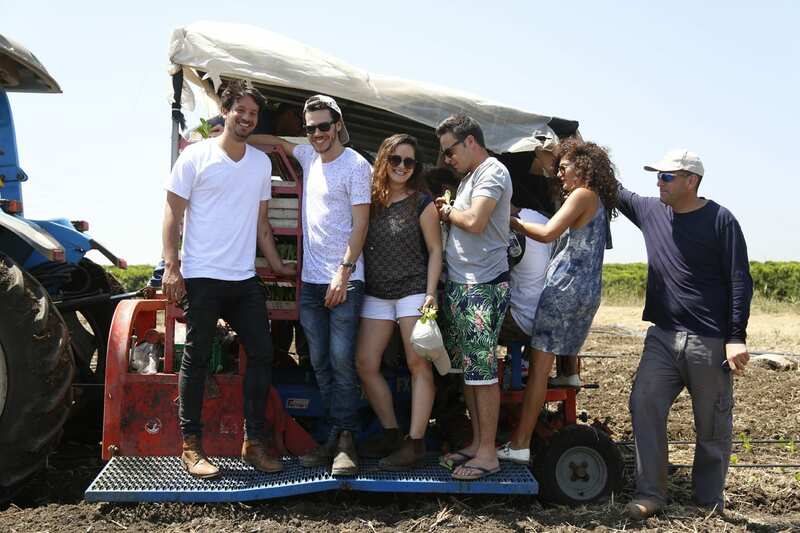 “We’re kind of a funfair for chefs in Tel Aviv,” says Gideon, a second-generation farmer from Moshav Hadar Am in the Hefer Valley. 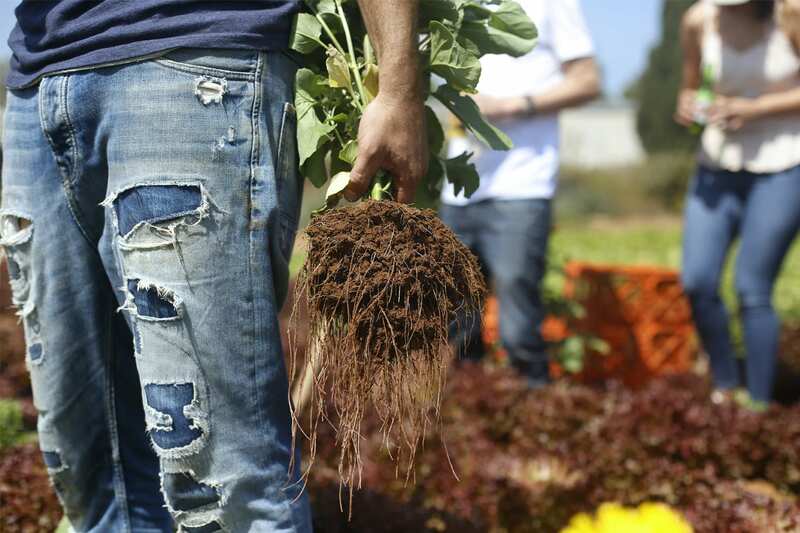 His father Uzi, an agricultural engineer, built the farm and was the first Israeli to successfully grow lettuce 365 days a year (lettuce only grows naturally during the winter). Gideon came to work on the farm after a successful career in the hi-tech industry, introducing technological innovation to the business, and today Aleh Aleh continues to thrill and surprise Israel’s culinary scene with the new varieties it develops and the quality of its produce: Japanese pumpkin, Thai okra, a unique citrus fruit known as Buddha’s hand, plantains, and various peppers from Latin America, in addition to more common vegetables. “When I met Yuval during our IDF reserve duty, he said he was an organizational consultant. We immediately decided to put our heads together and figure out how to create advanced, smart farming methods that would deliver the most delicious, freshest, daring harvest possible,” Gideon explains. Thanks to its closeness to Violet, the former restaurant of Chef Yossi Shitrit who now heads Mashya and Kitchen Market, a close collaboration developed between Yossi and the two entrepreneurial farmers. “Our curiosity, the fact that we are all so invested in our work, supporting all that we do – there’s always something to be researched, discussed, constantly asked about – it results in a strong bond between us and Yossi. He challenges us with his requests, and we’re always happy to see how he miraculously transforms these crops we work on tirelessly,” says Gideon. Now you can also enjoy the wonderful Aleh Aleh harvest in your home kitchen, thanks to their delivery service. If you want to enjoy more of the mysterious fruits and vegetables you sampled at Mashya – along with traditional tomatoes, cucumbers and peppers, check out the Aleh Aleh website and receive a 10% discount when you present a Mashya voucher.